Mechanic’s Liens are something that very few home owners and even some contractors know little about. With the slow economic times that we’re all in the topic of mechanic’s liens has been coming up lately. It’s worth taking a few minutes to discuss what home owners and contractors need to know about them. Mechanic’s Lien Laws were developed over the years to protect contractors who provide services and never get paid for that work. Basically a mechanic’s lien is a security interest in the title to a piece of property. Mechanic’s liens are very similar to tax liens. It’s worth noting that every state has different lien laws so it’s very important to check on local laws with regard to liens. Every contractor, sub-contractor and supplier that works on or supplies materials to a construction project has the right to Lien a property if they are not paid. However, in order to take advantage of lien laws there are typically some very important steps that must be taken. First and foremost the contractor/supplier must contact the owner and notify them that they have been hired to provide a service or materials for the project. That notification must include language (State specific) notifying the owner that they reserve the right to lien the property if they are not paid (typically the real issue is the general contractor not paying subs or suppliers). If the proper notification is made to the owner during the project and they are not paid for their work then they have the right to record the lien for that property. Recording the lien is similar to recording any real estate transaction. The important part here is the lien must be recorded within a certain number of days after substantial completion of the project. Each state uses different time frames but it’s typically 90 days or less. If you miss the deadline you’re out of luck. Once a lien is recorded it typically must be “perfected” in order to ensure payment. Perfecting the lien means to file a lawsuit to foreclose on the lien. This forces the property to be sold and all creditors to be paid. The tricky part here is making sure the property is worth enough money to pay off everyone. The original mortgage (bank typically) will hold the first position and get paid first. If you try to foreclose a house that won’t have sufficient money to pay off the bank then you wont’ receive anything. So what does all this mechanic lien stuff have to do with the home owner? Well for starters it’s important to know about the process and what a lien notice means to you. 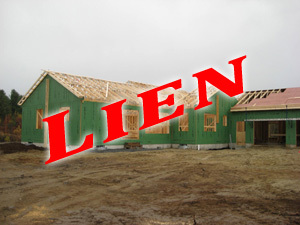 Don’t be alarmed if you receive a notice of lien from contractors working on your home. It’s their right to do so and it is something that most banks now require of contractors. It also means that you need to be sure that whomever you’re paying (general contractor) that they are paying their bills. Today most banks are requiring that home owners get a lien waiver from the contractor before a construction loan disbursement is made. Basically you get a waiver from the general contractor and subs that they will be paid for previous work under the current payment and they waive their right to lien. This ensures that everyone is getting paid each time a disbursement happens. If you interview contractors ask them about their lien experience and processes. If they seem perplexed or non interested then maybe you want to consider a different contractor. The entire lien waiver process can help you in the long run if you understand how it works and why it’s important. The last thing you want is to have your home and property liened so that a sub-contractor can collect money owed them.